» Forum » Game manufacturers » Homebrew pinball » 1/3 Scale Homebrew Tabletop Pinball "Binary Star"
» 1/3 Scale Homebrew Tabletop Pinball "Binary Star"
1/3 Scale Homebrew Tabletop Pinball "Binary Star"
I'm building a homebrew tabletop pinball machine, machine name is "Binary Star". One-third of real arcade pinball size. Use solenoids, control by Arduino MEGA. Do i spy a knocker in the cabinet? Neat stuff bud!!! Keep the updates coming! Very impressive! That would go great with those new arcade1up arcade cabinets. That's what I'm talking about!!! Scaled down pinball is still pinball folks!! Awesome! Will follow on Twitter. Please keep us posted here with major updates. Now you can play pinball anywhere!!!! This is so cool, please continue to post here. Great sounds! Classic pinball in a small package. Love it!!! We need more genuine tabletop pinball! Perfect to introduce people in a casual setting while taking up minimal space! Yes!! That is exactly what I want to be doing myself!!!! 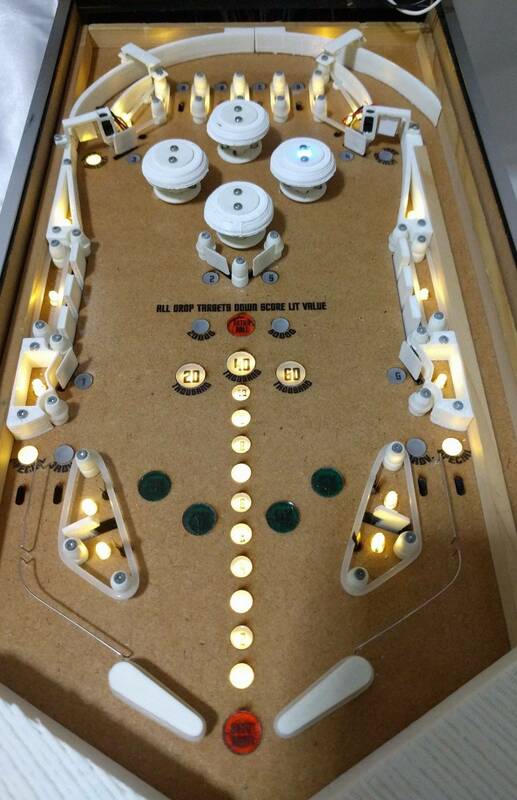 I'm glad somebody else has interest to make tabletop pinball machines!! I will be watching this thread and hopefully add one myself in the future. Keep up the good work and i'll be watching for updates!! Stern AC/DC LUCI Pinball - CUSTOM MATCHING Coin Door Decal!